JNN 21 Sept 2014 Sana’a : Ansarullah fighters of the Houthi movement have taken over the offices of Yemen’s state TV station after clashes with parts of the army commanded by the brother of ousted dictator, Ali Abdullah Saleh, in the capital, Sana’a. The new development came following fierce fighting between Ansarullah fighters and militia members of Salafist / Wahabi Islah party on Saturday evening. Shiite Ansarullah fighters shelled the offices of Yemen’s state broadcaster, forcing it off the air, and a university campus as they clashed with army troops and loyalist fighters in the heart of the nation’s capital. After the violence forced international airlines to cancel flights to the capital. The Salafists are backed by some army units, which are under control of Ali Mohsen al-Ahmar, the stepbrother of the country’s deposed dictator, Ali Abdullah Saleh. Earlier today, at least six Ansarullah fighters were Martyred and several other injured in fierce clashes near the state TV building. The fighting has been underway between Ansarullah fighters and members of Salafist Islah party in Sana’a since Thursday. Meanwhile, flights to Sana’a are suspended for the second straight day amid renewed fighting there. The government has also closed all schools and two universities in the city. The government of President Abdurabu Mansur Hadi has failed to reach an agreement with the well-armed Shiite rebels from the north, even though the parties seemed close to signing an accord last week. The fresh series of battles come despite ongoing UN-backed efforts to broker a deal between rival sides. 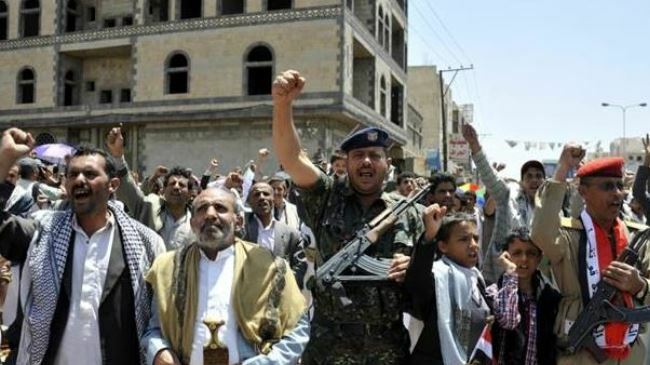 The Yemeni capital has been scene of protests by Ansarullah members for weeks, demanding the establishment of a new government and reinstatement of fuel subsidies. The protesters say the government is corrupt and marginalizes the country’s Shia community. The Human Rights Watch (HRW) recently called on Yemeni authorities to probe the use of force against anti-government protesters in Sana’a and other cities. The Houthi movement played a key role in the popular revolution that forced former dictator, Ali Abdullah Saleh, to step down in February 2012. Saleh, who ruled Yemen for 33 years, stepped down in February 2012, under a US-backed power transfer deal in return for judicial immunity, after a year of mass street demonstrations demanding his ouster. This entry was posted in Middle East and tagged Ali Abdullah Saleh, Ansarallah, Ansarullah, Shia Houthi Fighters, Shiite Ansarullah, state TV station, Yemen. Bookmark the permalink.